He’s always there to greet the customers with a smile. Also, if allowed, he’ll hop up on his back legs and lick their faces, sniff at their behind, and bark at the mailman. 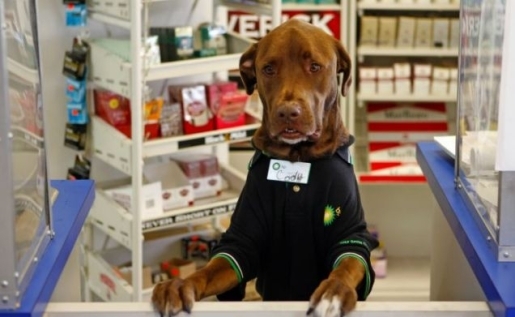 No, it’s not some kind of publicity stunt gone wrong, it’s just Cody, the dog who works at a convenient store. Cody’s owner, Karim Manour, started bringing the dog to work about five months ago during early morning shifts, and he’s proven to be such a big hit he’s been promoted from store pet to valued employee! He’s even something of a celebrity among the customers of the Clearwater, Florida convenience store. The chocolate Labrador Retriever is now a front-runner for employee of the year, thanks to his high customer approval rating. Here’s hoping he takes his next paycheck and gets himself pampered a little bit. He’s earned a day at the spa and a nice dinner out.